Day before yesterday I got back from grad school; today I got myself a brand-new kitten. I act fast! I went to the Bonnie Hays Shelter in Hillsboro and played with a couple of kittens. One was adventurous and playful. She had ocelot stripes in her tabby coat, and black war-stripes by her eyes, and perhaps it was just that I’d been rereading The Phoenix Guards, but this headlong, warlike little girl called out to be named Tazendra and taken home. Tazendra, the Dzurlord created by Stephen Brust, is so fearless that she laments the unfairness of having five on her side against an army—she’d rather do it by herself. 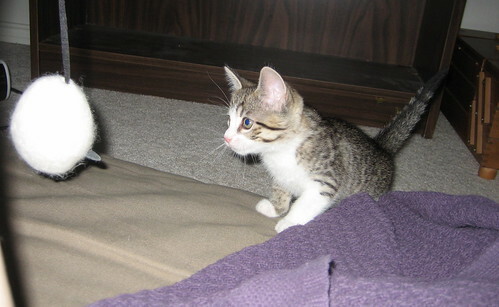 Tazendra, the tiny kitten in my lap, is so fearless that she explored her entire room of the house in the first 90 seconds and wants to get out and explore the parts of the house occupied by Qubit. Qubit isn’t terribly pleased about the whole other-cat smell and so forth. We’re hoping they’ll get used to each other’s smell under the door before Tazendra gets TOO stir-crazy. So, for the record, adult Qubit takes 3 hours to decide a room is safe enough to stop cowering under the couch; kitten Tazendra took 3 minutes to decide she wanted to go out into the unknown where an adult cat was hissing. Yeah, I named her well. It could have been so much fun if you’d named her Q-tip. ;o) Very cute kitty. Very cute kitty; and welcome home. Regarding LadyLong’s comment on the eye color of cats v. humans in pictures, many animals have a layer of “tapetum lucidum” in their eyes. A fuller explanation can be found here http://science.howstuffworks.com/question51.htm . She is a cute kitten indeed. I will have to meet her sometime soon, with allergy drugs in hand, of course. I know! I saw that on the BBC and I thought, who thinks something like that will work? Poor baby tigger.